I am excited to share my interview with The Drive Magazine on positive psychology and stress resilience. Inspired by my TEDx Talk: Thriving Under Pressure. My favourite part of this photo is the story behind it. When the magazine was arranging the photo shoot, they asked where my favourite place to recharge was in Windsor (Ontario, Canada). I shared that it was a top of Blue Heron Hill overlooking Lake Heron and Lake St. Clair. So you can just imagine the photographer hiking his equipment up the hill, with me tagging along in my wedge high sandals! But the reward was worth it.. I hope this interview encourages you to keep shooting for the stars and believing in your dreams. Ultimately reminding you that the power within you will always be greater than the challenges around you. Click on The Drive Magazine to read the full interview. You Can Do College Event. I love sharing ideas with students. I can’t imagine a better moment in life to learn about purpose and empowerment than when we are young. Which is why I embrace every opportunity to share the principles of positive psychology with students across Canada. 600 grade 10 students from 14 high schools participated in the 2 day conference. The purpose of the event was to introduce high school students to all the programs available to them when they graduate in a few years. Showing them that if they work hard today — “They Can Do College” in the future. Whether it be as a civil engineer, a veterinary technician, a nurse, or an early childhood educator. The choice is theirs to make. Pay attention to the person right in front of you. They have something to teach you. Connecting with audience members is essential for me. No matter how big or small the crowd. Accordingly, I encouraged students to answer as many questions as they could (which they did!) as I walked and talked freely with the large crowd. Hoping to meet as many of the 600 students as I could. One of my favourite moments was when the young gentleman above shared his lifelong dream of becoming an engineer. Just listening to his mission shifted me to a higher place. The icing on the cake was hearing about destiny from a student named Destiny. Destiny aspires to be a cosmetologist to the stars one day. How cool is that! The next time you meet a student, ask them about their dreams. The stress they’re experiencing immediately disappears. 1000 views on the official TEDx site! I have been working on a TEDx project with the University of Windsor TEDx team since last year. And just an hour ago, I received the good news that the finished video was uploaded to the official TEDx site today! So pumped! If you like, please share this TEDx video with friends and family on social media. The wider its reach, the more people I can help thrive under pressure! You have the power to change the story. What are the most powerful words in the universe? The ones you use to talk to yourself. Choose the words that move you forward, the emotions that lift you up, and the actions that empower you. Believe in the one reason that a difficult situation will work out. You have everything it takes to overcome. TEDx Photos: Diamonds from Pressure. I am excited to share an interview, photos, and a short video clip from yesterday’s TEDx Event at the University of Windsor. It was one of the most positive speaking experiences I’ve ever had. Truly magical. Related Post: How I prepared my TEDx Speech. TEDx Preparation: Diamonds from Pressure. I have some exciting news to share! I was recently chosen to be a TEDx speaker for the University of Windsor TEDx Event on Sunday, January 28, 2018. The theme of the event is “Diamonds from Pressure”. Which fits in beautifully with my psychology blog — Thriving Under Pressure. The process of preparing a TEDx Talk has been quite different from any other keynote or seminar I have given. I have maximum 18 minutes to convey an original idea. So I have no choice but to get right to the point. Which is a very good thing! 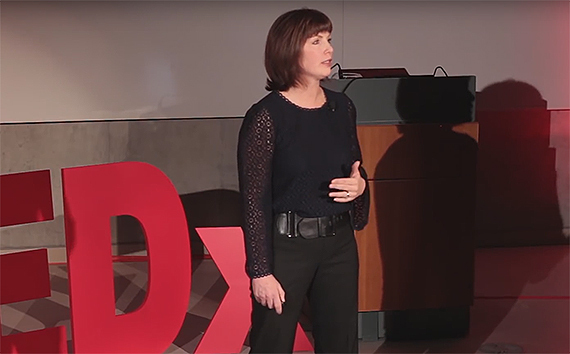 The purpose of my TEDx Talk is to help people thrive on their journey from stress to strength. This is where you let your imagination run free. Luckily inspiration flowed in from everywhere! So much so that while at the movies last month, I was struck by an idea with only a movie napkin nearby. So I did what all writers do, I wrote on whatever material I could find. Hoping to capture one fleeting burst of insight. In case you’re wondering, there are approximately 2500 words in an 18 minute TEDx speech. Thus I have been equally busy downsizing, condensing, and editing my script. Focus is the goal. Less is more! Practice your TEDx speech as often as you can. In the mirror. On your run. In the car. At the mall. In front of anyone who is willing to listen. Stay open to feedback. As much as you can. Record yourself and listen back. This is especially important for hitting the 18 minute time limit. I used an audio to text dictation iPhone app called TEMI that helped tremendously. TEDx Diamonds from Pressure is just 10 days away. The outline, the structure, and the body of TEDx complete. The stories worked out. The edits made. Just one last dress rehearsal on the TEDx stage! Hope to see you all January 28 2018! The field of positive psychology has been a blessing for me, both personally and professionally. For not only is strengths finding essential for illuminating the abundance in others, it is essential for harnessing the bounty in ourselves. As each time we witness the light shining brightly in another, we see their radiance reflected back in ourselves. Identify 2-5 strengths that you witnessed in others today. Describe how seeing the strengths in others brought out the strengths in you. Related Post: Positive Psychology on Campus. If you need help with finding the good in others especially the challenging people in your life click on this this link to a great article in Psychology Today. The unexpected benefits of stress. Most people wince every time they hear the word “stress”. It’s as if the whole world has been conditioned to respond to stress the same way, by word alone. A habitual thought response that is often more dangerous than the stressor itself. The latest research in psychology examines stress in an entirely new way. Rather than viewing stress as unequivocally bad for one’s health, health psychologists pinpoint belief systems as the moderating variable between stress and biology. Which is one of many reasons why I love Dr. McGonigal’s TED Talk. She encourages us to think about stress in a whole new empowering way. With an emphasis on growth, purpose, and meaning over needless suffering. Using health psychology research, Dr. McGonigal reveals how perceiving stress as either positive or negative can have a “live or die” impact on individual stress response. Change your thoughts. Change your stress response. Believe that stress is good for you (eg., stress heightens awareness) and you live longer. Alternatively, believe that stress is bad for you (eg., stress causes heart attacks) and you die sooner. You need to experience your own “Aha Moment” firsthand. In the video below, Dr. McGonigal illustrates the many upsides of stress, including help seeking behaviour, increased energy, and robust health. She also backs up her stress positive claims with census records and comprehensive health research. Hope you enjoy these fresh, new ideas about stress as much as I do! Related Post: Stress resilience at school.